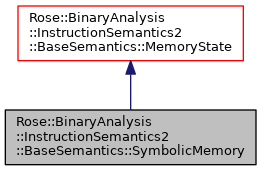 This memory state stores memory as a symbolic expression consisting of read and/or write operations expressed symbolically. The memory state can be passed to SMT solvers and included in if-then-else symbolic expressions to represent different memory states according to different paths through a specimen. Definition at line 22 of file SymbolicMemory2.h. Definition at line 34 of file SymbolicMemory2.h. Definition at line 40 of file SymbolicMemory2.h. Definition at line 45 of file SymbolicMemory2.h. Converts x to a SymbolicMemoryPtr and asserts that it is non-null. Definition at line 52 of file SymbolicMemory2.h.